“I think that after six box sets and 24 episodes, if Big Finish can’t produce something consistently compelling, maybe I need to finally call it quits.” So said me in my review of the previous UNIT box set, Cyber-Reality. But much like John Nathan-Turner, I’ve been persuaded to stay, and so here I am to review Revisitations. Thankfully, it’s worth it. I don’t think it should have taken this long, but this set is probably the best use of the UNIT format there’s been. Like Encounters, it definitely benefits from consisting of multiple short stories, rather than stretching one story of doubtful complexity out across four discs. But more importantly, the stories here show an interest in the characters of the UNIT regulars and the nuances of the UNIT set-up that has largely been lacking from the previous six seasons. Hosts of the Wirrn starts things off, with UNIT’s first two-disc story. 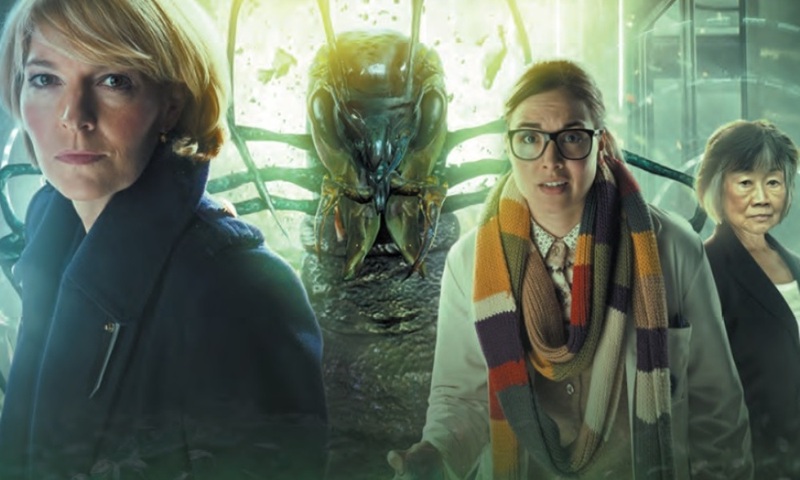 UNIT has been given the strange gift of a Wirrn queen (The Ark in Space), and Osgood recruits entomologist Shana Siddiqui (Vineeta Rishi) to help analyse and combat the threat. Chris Chapman populates his script with a lot of nice touches, such as Osgood using the robotic ravens as a recruiting tool, or an ex-UNIT medic who now boards UNIT personnel. Kate, Josh, and Osgood especially come to life in this story, with Shana quickly established as a new member of the UNIT team. The second part does kind of descend into the giant shoot-’em-out approach that doesn’t work great on audio, but the first two-thirds of the story play with the Wirrn concept in interesting ways. An enjoyable adventure that more UNIT stories would do well to emulate. On one hand, Breach of Trust is a pretty standard alien encounter and negotiation story; one could imagine it being an episode of Star Trek: The Next Generation, as the characters weigh the difference between political expediency and moral principles. On the other hand, I think it’s the very best story in the history of this series. David K. Barnes’s script has alien refugees seeking asylum on Earth, and UNIT must decide if they’re to be trusted. I’ve occasionally complained that the UNIT range portrays Kate as a generic military commander, not the thoughtful “science leads” woman she was introduced as in The Power of Three. Breach of Trust does a great job by the characters by showing a range of reactions to one situation, reactions that are rooted in who these people are. Initially, Josh and Colonel Shindi are sceptical of the refugees, Kate and Osgood more open-minded. But as time goes on, Kate’s position at the head of UNIT forces her to be pragmatic, while Osgood wants to maintain her idealistic stance. Barnes’s character writing is deft — the conflicts are natural, rising out of their known backstories and personalities; when they boil over, you buy it. The plot of the story is pretty simple, but it shows how Kate Stewart’s UNIT is not her father’s in a highly effective manner, and I hope we hear more like it in future. Roy Gill’s Open the Box closes out the set, bringing back the mind parasite from The Mind of Evil. It’s an okay story. It has a number of interesting elements — like a training centre, a new life for Pik-Sen Lim’s Chin Lee (back after 47 years! ), dark fears inside the UNIT team — but I thought most didn’t have interesting executions. It’s neat to get Chin Lee back and make her not a villain… but she’s kind of just there. I like jokes at the expense of mandatory trainings as much as the next academic, but the retreat centre didn’t go far outside of the usual clichés. Unlike the other two stories, which nailed it, this one felt more like a first draft, albeit a draft with more potential than many previous UNIT stories. One of the main issues is that the story wants to give us psychological insight into the UNIT regulars, but it feels generic and detached when it does; it would be nice if its treatment of Kate, for example, followed on from the tough calls she made in Hosts of the Wirrn and Breach of Trust, but her anxieties here are more general. Still, this is the strongest UNIT set to date. I think you can feel the actors rise to the more detailed character work they’re asked to do here, Jemma Redgrave especially, whose tough-but-compassionate Kate Stewart really comes across in the first two stories. Plus she gets a good comedy scene about a bad date. (It would be nice to know more about her personal life, to be honest.) I always feel like UNIT is on the verge of coming together as a range; hopefully this time really is finally it. Revisitations (by Chris Chapman, David K. Barnes, Roy Gill; starring Jemma Redgrave, Ingrid Oliver) was released by Big Finish Productions in November 2018.